Friends and colleagues of Shoreham Airshow pilot Andrew Hill have painted a picture in court of a diligent flyer who never skimped on safety. Mr Hill denies the manslaughter of 11 people in a crash during his display at the show in August 2015. The Old Bailey has heard the crash was the result of continuing with a manoeuvre when he knew his plane was too low to perform it safely. But former colleagues and pupils said he always set "exemplary standards". Mr Hill, 54, of Sandon, Hertfordshire, escaped serious injury when his Hawker Hunter jet crashed on to the A27 next to Shoreham airport during a display on 22 August. But 11 men - some of them spectators, others motorists using the busy road - died when the jet landed on the dual carriageway and burst into flames. The prosecution has argued that he decided to continue with his loop manoeuvre when he should have known he was not high enough to complete it safely, and the "deliberate" decision was part of a "catalogue of errors". Mr Hill's defence team says the G-forces in the jet's cockpit affected his judgment and contributed to the errors that led to the crash. A string of pilots who had flown with - or been taught by - him paid tribute in court to his ability. 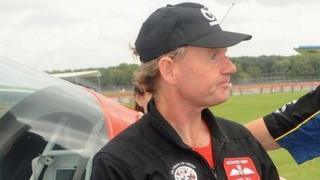 Former Red Arrows commander Andrew Offer said: "Andy always set exemplary standards to his students and peers. His attitude is always prudent and he has always worked within his capability." RAF pilot Charles McIlroy said: "He was excellent when managing risk - he would question anything if he wasn't happy with it." And commercial pilot Gareth Burgess, who was taught by Mr Hill, said: "He was an approachable and friendly character with whom I would trust my life."